The March issue of Nature Biotechnology brings together a set of articles that provide an overview of promising RNA-based therapies and the challenges of clinical validation and commercialization. In his News and Views essay, “Hearing in the mouse of Usher,” John V. Brigande, Ph.D., provides commentary on two studies in the issue that report important progress in research on gene therapy for the inner ear. One in eight people in the United States aged 12 years or older has hearing loss in both ears. That figure suggests that, if you don’t have hearing loss, you likely know someone who does. Worldwide, hearing loss profoundly interferes with life tasks like learning and interpersonal communication for an estimated 32 million children and 328 million adults worldwide. Inherited genetic mutations cause about 50 percent of these cases. The challenge in developing gene therapy for the inner ear isn’t a lack of known genes associated with hearing loss, but a lack of vectors to deliver DNA into cells. Brigande, associate professor of otolaryngology and cell, developmental, and cancer biology at the OHSU School of Medicine, provides perspective on companion studies that demonstrate adeno-associated viral vectors as a potent gene transfer agent for cochlear cell targets. The first study demonstrates safe and efficient gene transfer to hair cells of the mouse inner ear using a synthetic adeno-associated viral vector that promises to be a powerful starting point for developing appropriate vectors for use in the human inner ear. The second study demonstrates that a single neonatal treatment with this viral vector successfully delivers a healthy gene to the inner ear to achieve unprecedented recovery of hearing and balance in a mouse model of a disease called Usher syndrome. Individuals with Usher syndrome type 1c are born deaf and with profound balance issues and experience vision loss by early adolescence. The research teams were led by scientists from the Harvard School of Medicine. Brigande sees these new studies as potentially spurring investment and kickstarting the development of new approaches to correct a diverse set of deafness genes. Hearing Restoration Project consortium member John V. Brigande, Ph.D., is a developmental neurobiologist at the Oregon Hearing Research Center. He also teaches in the Neuroscience Graduate Program and in the Program in Molecular and Cellular Biology at the Oregon Health & Science University. This blog was reposted with the permission of Oregon Health & Science University. Balancing is pretty great. Not needing to think about how to stand upright is something I yield great benefit from, but is something that occurs without conscious effort or thought. I am fortunate, but many are not. This week is Balance Awareness Week, and HHF is highlighting the the inner ear and its mechanics! The inner ear is a tiny but notable body part; not only is it important to hearing, but it is also where the balance organs and nerves are located. The basic components of the inner ear include semicircular canals, the cochlea, the utricle, the saccule, and the vestibulocochlear nerve. The cochlea and one half of the vestibulocochlear nerve (the cochlear nerve) are in charge of hearing. The remaining semicircular canals, utricle, saccule, and vestibular nerve are responsible for balance. There are three semicircular canals that contain fluid to activate sensory hair cells, which are arranged at ninety degree angles and detect different kinds of movement: up and down, side to side, and tilting. The utricle connects the semicircular canals to the saccule, which also detect motion. They are located in the vestibule inside of the labyrinth, which is the bony outer wall of the inner ear. All of this is the vestibular system. But it is not only the vestibular system that assists with balance. Vision and sensory receptors (muscles, joints, skin, etc.) all transmit messages to the brain that work together and voila! balance. Vestibular disorders can have a big effect on one’s equilibrium. People might experience dizziness, vertigo, or imbalance, as well as other inner ear-related issues. A commonly diagnosed balance disorder is Meniere’s disease, which is one focus areas for our Emerging Research Grant (ERG) recipients. Balance disorders can disrupt everyday life for those who experience them. It is also fairly common - in fact, about 69 million Americans or 35% of adults aged 40 and up have experiences vestibular dysfunction at some point in their life! While it might be hard to believe something as tiny as the inner ear can affect a person’s ability to participate fully in daily life, HHF is fully committed to funding research that explores hearing and balance health. Donate today to support groundbreaking research! The goal of the Hearing Restoration Project (HRP) is to determine how to regenerate inner ear sensory cells in humans to eventually restore hearing for millions of people worldwide. These sensory cells, called hair cells, in the cochlea detect and turn sound waves into electrical impulses that are sent to the brain. Once hair cells are damaged or die, hearing is impaired, but in most species, hair cells spontaneously regrow and hearing is restored. The HRP is aiming to enable this ability in humans. All cells develop through a chain of events triggered by chemical signals (proteins) from outside the cell. The signals kick off responses inside the cell that can change the cell’s ability to proliferate (grow and divide) and differentiate (take on specialized functions). The Wnt signaling pathway, a sequence of events triggered by the Wnt protein, helps guide inner ear cell development, including the proliferation of cells that differentiate into the hair cells and supporting cells necessary for hearing and balance. But in mice and other mammals, inner ear cell proliferation does not continue past newborn stages. Underscoring their importance in evolutionary terms, Wnt signals occur across species, from fruit flies to humans—the “W” in Wnt refers to “wingless”—and Wnt signaling is guided by dozens of genes. Albert Edge, Ph.D., Alain Dabdoub, Ph.D., and colleagues performed a comprehensive screen of 84 Wnt signaling-related genes and identified 72 that are expressed (turned on) during mouse inner ear development and maturation. Their results appeared in the journal PLoS One this February. The Wnt signaling network has three primary pathways. Two are known to be integral to the formation of the mammalian inner ear, including the determination of a cell’s “fate,” or what type of cell it ultimately turns into. This is particularly significant because the inner ear’s sensory epithelium tissue is a highly organized structure with specific numbers and types of cells in an exact order. The precise arrangement and number of hair cells and supporting cells is essential for optimal hearing. 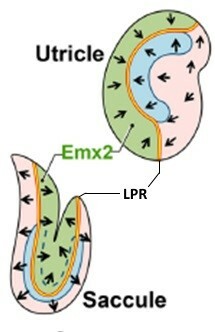 The relationship between the Wnt-related genes, the timing of their expression, and the various signaling pathways that act on inner ear cells is extremely complex. For instance, the composition of components inside a cell in addition to the cell’s context (which tissue the cell is in, and the tissue’s stage of development) will influence which pathway Wnt signaling will take. It is known that inhibiting the action of Wnt signaling causes hair cells to fail to differentiate. The new research complements previous chicken inner ear studies of Wnt-related genes as well as a recent single-cell analysis of the newborn sensory epithelium in mice (conducted by HRP scientist Stefan Heller, Ph.D., and colleagues). Comprehensively detailing these 72 Wnt-related genes in the mouse cochlea across four developmental and postnatal time periods provides a deeper understanding of a critical component of hair cell development, bringing the HRP closer to identifying genes for their potential in hair cell regeneration. A few years ago, my dad began experiencing hearing loss. He worked in loud factories all his life. And while in recent years he began wearing ear protection, I think there were many days on the job where he didn’t use any. As he grew older, all that time without ear protection took its toll. Falls: This was my first area of concern when my dad’s hearing loss was diagnosed. I knew that our ears play an important role in our balance. However, I was surprised to see how significantly one’s chances of falling increased with their hearing loss. WhittierHearing.com cites a study that found that even just mild hearing loss meant you were “three times more likely to have a history of falling.” Of course, the older someone is the more dangerous these falls can be. My dad was lucky in that his hearing loss didn’t ever seem to affect him in this way. But if you have a loved one who has fallen or is experiencing balance issues, get their hearing checked! Depression. We actually began suspecting that my dad was experiencing hearing loss long before he began seeking treatment for it. I think he was simply too proud to admit that he was having problems. We had to repeat ourselves to him and sometimes at family gatherings he would withdraw altogether. It was when he stopped going to his weekly Men’s Breakfast at our church that we knew something was going on. While my dad received treatment before his hearing loss really began to take a toll on his mental health, I can definitely see how it could lead to depression. People experiencing hearing loss may experience poorer quality of life, isolation and reduced social activity. Dementia. Through my research, I found out that in older adults there is a connection between hearing loss and dementia and Alzheimer’s. Those with mild hearing impairment are nearly twice as likely to develop dementia compared to those with normal hearing. The risk increases three-fold for those with moderate hearing loss, and five-fold for those with severe impairment. It isn’t yet clear what causes the connection, but the article says some researchers believe it may result from those with hearing loss straining “to decode sounds,” which may take its toll on the brain. So, what can you do to protect your hearing? I’d like to suggest going for a swim. Here’s why: This guide on swimming and heart health notes what an excellent cardiovascular and full body workout swimming can be. That’s important because there have been many studies showing a connection between heart health and hearing. Yet another reason to be sure you’re getting plenty of exercise! See our Hearing Health story, “Have a Hearing Loss, Have Another Health Issue?” for more information about health conditions associated with hearing loss.